The Orc king's palace, also known as Orsinium Keep, is modeled after the royal castle of Scarp Keep in Old Orsinium. Strong foundations, thick walls, and wary sentries protect the home of the Orc king. 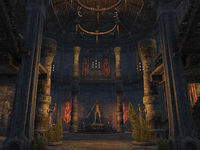 Scarp Keep is the seat of the king in Orsinium.